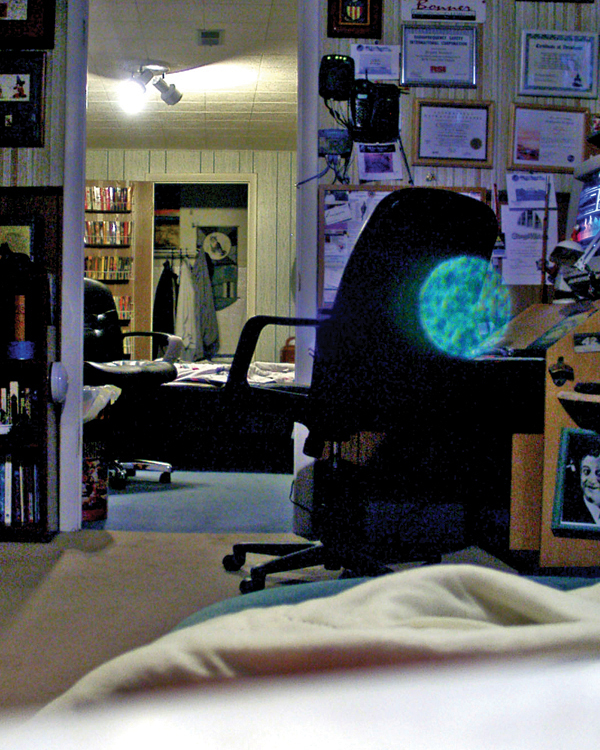 The most common type of supposed paranormal image on the internet is the "Orb". This type of image has gone from being something that would be thrown away because it was obviously a bad photograph to becoming the "proof of ghosts"
This type of image has been classified as several different things, depending on the goal of the person doing the classification. The history of ghost photography can be traced back to the first photographic images. However until the past decade the images have been a full form or at least partial apparition of a human. This changed around the time that the digital camera was introduced. 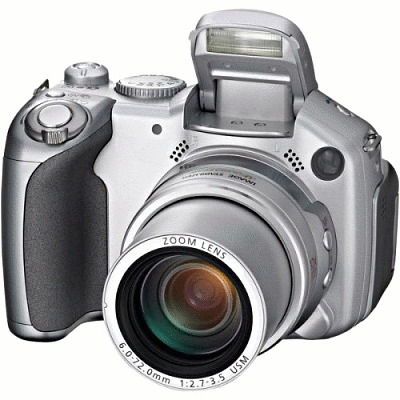 The camera itself was originally a large contributer to the issue because of low resolution image capture technology, the low quality sensors would cause different types of odd images because of digital artifacts, this is no longer a problem as long as a good quality camera and the proper settings are used. The origins of the Orb can be tracked back to the International Ghost Hunters Society and it's founders. They were the first to coin the term "Orb" as a ghost-photography term. This happened just as the majority of the public was starting to use the internet and the timing was perfect to set off one of the most mis-understood images in the paranormal world. The qualifiers for a "real" Orb have been created by people who are looking for proof that Orbs are some type of paranormal phenomena and not proof of what they really might be. The rules that they use can easily be explained with real world mundane answers, but unfortunately these are not the fun explanations that make whoever picks up a camera and takes bad photographs a "real ghost hunter". When a camera captures an image it needs light to record it. This applies in all types of photography, Digital, Film, and Video. 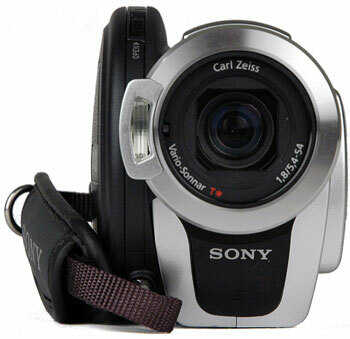 The camera has a lens that focuses the light on a specific location that either has a light sensitive sensor or film. The lens in any camera is not perfect and can cause different types of unexplained shapes and lights on the image. The history of the Orb photograph can also be traced to the cost of photography. In the days of traditional film photography, we did not take photographs in areas that we knew would not produce a usable image. Now that it does not cost anything to capture an image, people are willing to take a photograph in areas such as dark basements, outdoors at night and other places that will produce odd results. This of course does produce an odd result and then becomes a "Ghost" photo bcause people do not understand what has caused the image. 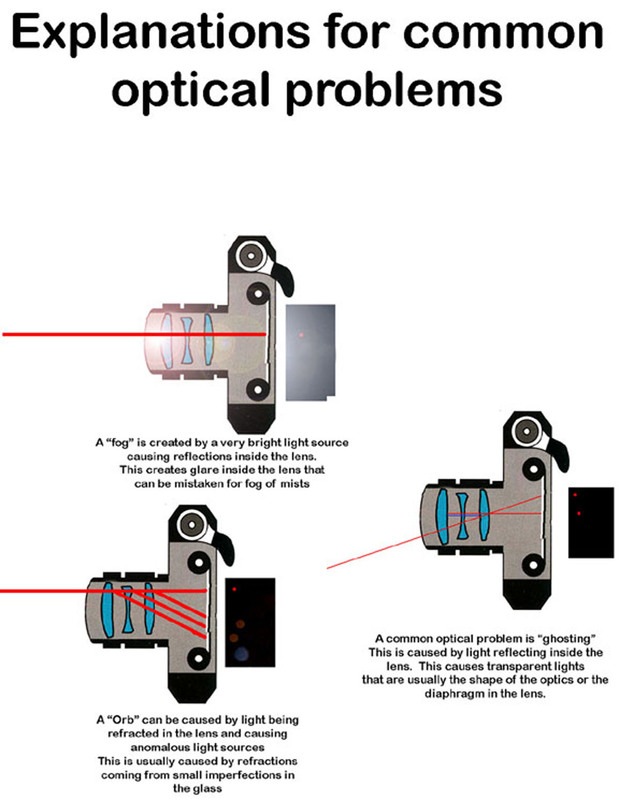 A lens refraction is a common photographic error that can cause Orb's of different types. It can cause traditional Orbs as well as strange fog and "ghosting". This is a classic example of a lens flare type of Orb. The light source causing the Orb is a flashlight just outside the field of view located to the right of the camera. This image meets the requirements to qualify as a "real" Orb by the standards of orb believers. It has a unique color, a round shape and even has a texture that if looked at long enough could have a face or molecular construction. This sample shows the way that a lens flare can create orbs. 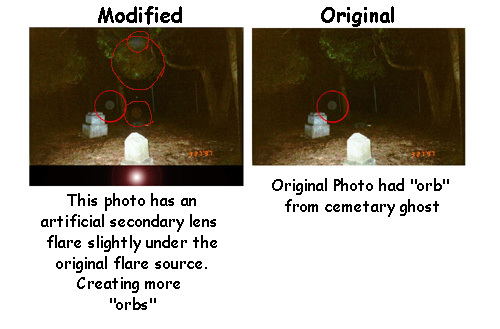 The addition of more Orbs was created by adding and additional bright light at the source of the original highlight. As mentioned previously, one of the requirements for a camera to capture an image it must have light. 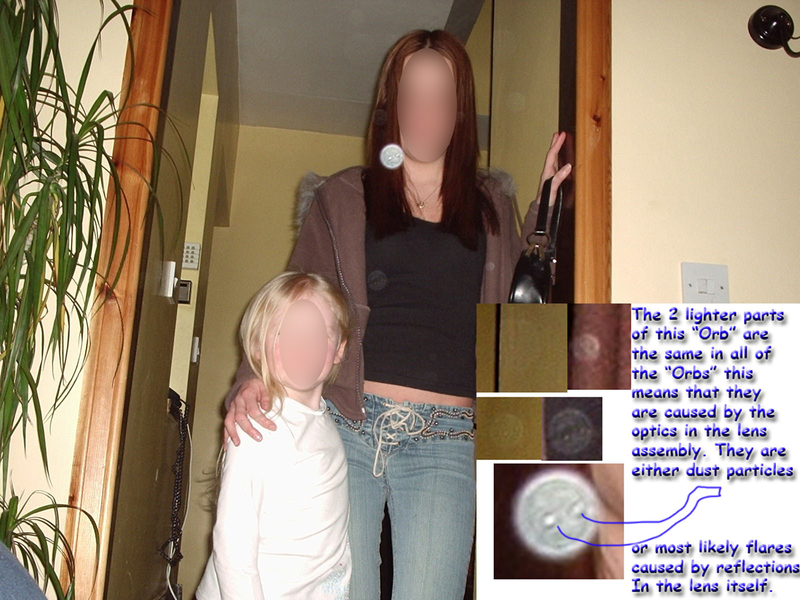 The majority of the Orb photographs that you will encounter have been taken by cameras the are either using an on camera flash or an infrared illuminator. Both of these cameras have a light that is used to illuminate the image. The Still camera has a flash that is located very near the lens. The Video camera has both a standard light to illuminate the image as well as an infrared illuminator, both of which are located near the lens. The reason that the images of Orbs occur in this type of image is because of the relationship of the lens to the illuminator. 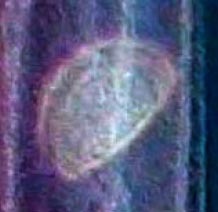 The believers will state that the Orb was not seen when the image was captured. While this is true, it is also part of the explanation of what the Orb really is. First we need to look at something that is very common in any area in the world (some places more than others) this is the exsistance of airborne particulates. What we mean by airborne particulates is Dust. The problem that most people have with this explanation is that they have a "clean" location and cannot see the dust that we explain that the Orbs are. By using this definition we can see that no matter where you go there will be dust of some kind, no matter how "clean" a location may be. The reason that we need to understand that there is atmospheric debris at all locations is because it is the cause of most Orbs in the world of bad ghost photos. to the lens it will appear to be much bigger than it really is. 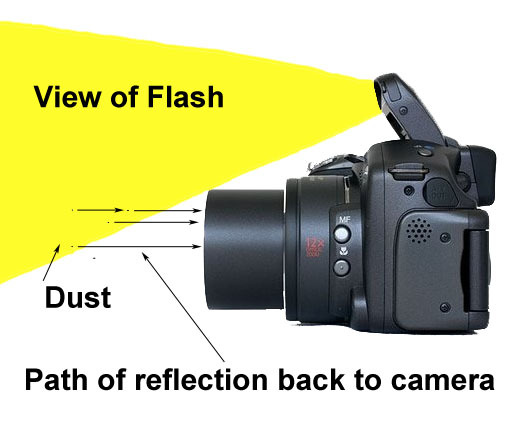 This illustration shows the way that a flash reflects the small particulates back into the lens of the camera. The particulates will appear as large objects because of the proximity to the lens. 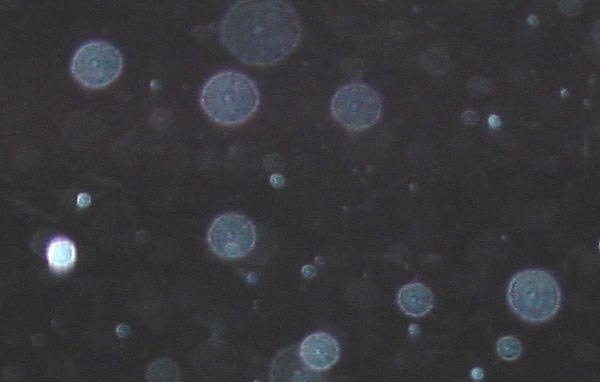 This image is a great sample of Orbs that have been created by atmospheric debris. The shape of the diaphragm in the lens (f-Stop) can determine the size and the shape of the Orb. This can be a variable because different manufacturers as well as different lenses will create different shapes because of the unique shapes of the diaphragm. The two different diaphragms shown here are just a small sample of the shapes that can be found in camera lenses. The shape of the Orb can be determined by this but the shape can also be influenced by the shapes of the lens, optics and the shutter of the camera. This is a classic example of an orb created by dust with the assistance of an odd shaped diaphragm. Another type of Orb is the Orb in motion. This is reported to be a orb that has a tail or is moving so fast that it has blurred in the image. 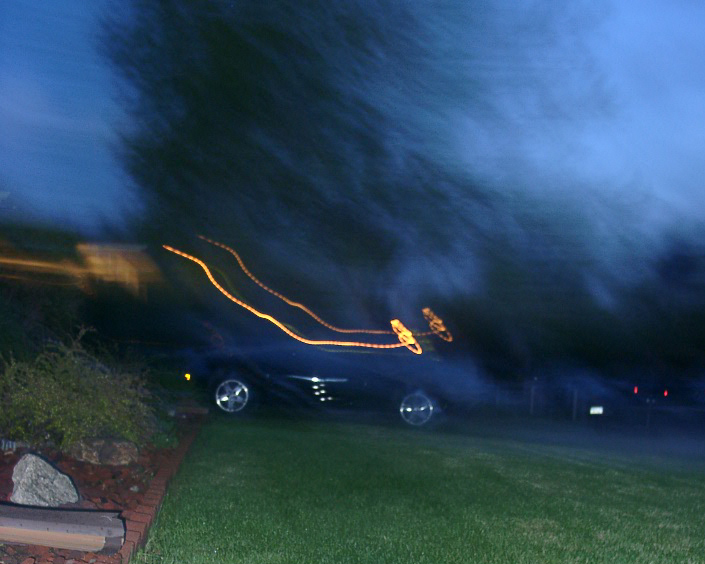 This is seen when an Orb is blurred in the image and the rest of the image is reasonably sharp. The cause of this type of image is when the flash on the camera is fired due to low light conditions (usually the camera is set on some type of night or night portrait mode) that will cause a slow shutter speed with the flash. This means that the close subjects will be reasonably sharp but any bright objects in the image will blur because of a long shutter speed. This image has subjects that have good lighting from the flash, but because of the long shutter speed the patio light blurred to become the lights that are seen here. 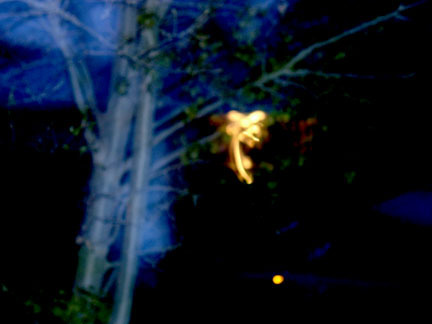 This is another example of the type of Orb in motion that has become know as being faeries, sprites, guardian spirits, etc... however it is nothing more that a blurred light with a flash and long shutter speed. These are just a few examples of what is being passed off as ghosts and spirits in photography. We need to be able to understand what is happening when we take an image so we will no longer think that bad photography is spirit photography.